Did you know that Tax Day is April 15? Happy Monday!! My taxes have been sent in, and I’m enjoying these deals and sharing them with all of you! Check out Lake Country Family Fun’s 2019 Waukesha County Tax Day Deals guide below. Lake Country Family Fun loves Kona Ice! You can find them in our Birthday Party guide, serving up yummy treats at Hartland Kids Day, and on Monday, you can find them participating in Chill Out Day. From 11:00 am to 1:00 pm, they will be giving free Kona Ice at the First Bank Financial Centre campus parking lot located at 155 W Wisconsin Ave, across the street from the Oconomowoc Community Center. Bruegger’s Bagels in Oconomowoc is offering you some “Tax Relief” with a $10.40 Big Bagel Bundle. A Big Bagel Bundle includes 13 freshly baked bagels and two tubs of cream cheese. Claim your deal here. If you pop into the Delafield Hardee’s between 7:00 am and 10:00 am, you may be able to snag a FREE sausage biscuit. Just say “Made From Scratch”. All NoodlesREWARDS members can get $4 off any online order of $10 or more! some money. Noodles & Company has locations in Delafield, Pewaukee, Waukesha, Menomonee Falls, Brookfield, and New Berlin. For the third year in a row, Grimaldi’s Pizzeria will feature their annual tax day promotion on April 15th. For one day only, guests can get a 16” Grimaldi’s Traditional cheese pizza for only $10.40. Toppings additional. While supplies last. Grab a Strawberry #DOLLARITA for $1! Applebee’s has locations in Delafield, Pewaukee, Menomonee Falls, and New Berlin. Grab a free medium sub with the purchase of a medium or large sub, chips and drink. Must use this COUPON. 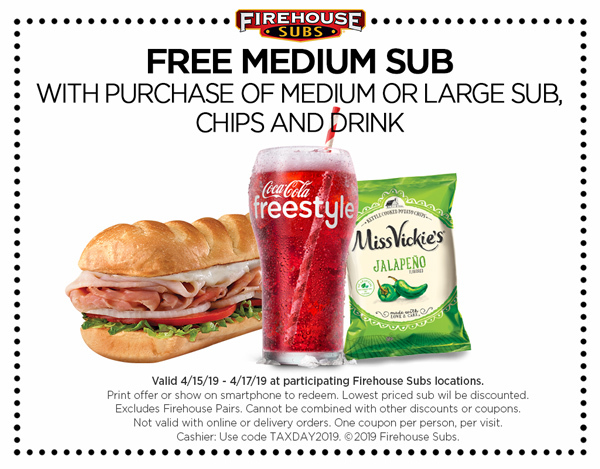 Firehouse Subs are located in Waukesha, New Berlin, Elm Grove, and Menomonee Falls. Now that tax day is here and nearly over, shred all that confidential paperwork! You can have 5 pounds of documents shredded for free using this COUPON. The coupon expires on April 27, 2019. Office Depot/Office Max has locations in Delafield, Pewaukee, Brookfield, and New Berlin. Boston Market is not technically in Waukesha County, but it’s close. They are having a special for a half chicken individual meal with two sides and cornbread, plus a drink for only $10.40. And don’t forget that Monday has A LOT of great deals for Kids Eat Free at area restaurants. PS. If we forgot a deal, be sure to let us know!! We’d love to make this a complete guide to help our readers save some $$! Happy Money Saving this Tax Day!